Birthday's are great occasion to prepare sweets and cakes. In India, payasam/ kheer is prepared on our star birthday's and I used to always look forward to it. These days, I always opt to baking a cake and leave the traditional sweets for Indian festival or celebrations. But, yesterday I decided to make gulab jamun in the place of cake, added a few candles and celebrated my brother in law's birthday. He loves gulab jamun's and so does everyone in the family. This recipe was adopted from the cook book, "The food of India". I used the mawa milk powder instead of non fat milk powder suggested. This adds a lot more flavor to the gulab jamun than the regular milk powder. It was super easy to prepare and they disappeared in one afternoon. Oil - enough for frying. 1. In a heavy bottom pan add sugar and water allow to come to a boil. Reduce the heat and let it simmer for 3-4 minutes. Remove from heat, add saffron and cardamon powder. 2. Add all the dry ingredients ( milk powder, self raising flour, rava ) and mix well with your fingers. Add ghee and rub it into the mix. add a powdered pinch of saffron. Add milk and make it into a stiff dough. 3. Make balls by lightly rolling them without pressing them too hard and keep aside. The balls must be the size of a quarter. 4. Heat the oil on medium heat, add a tiny bit of the dough into the oil to see if it ready for frying. If the dough surfaces up easily reduce to heat to a little over low. 5. Drop a few balls at a time and using the spatula keep twirling the oil and moving the balls. When they turn golden brown add them to the syrup. Allow them to soak well, cool and serve them. Juicy and yummy jamuns makes me drool..
Wow the jamun looks very perfect and inviting. I've been meaning to make this classic Indian treat for ages. Lovely presentation. That bowl of jamuns makes me drool here.. I live in India and i want to prepare jamuns this way for diwali. what is the alternate for Mawa milk powder? And what's APF? Thank you for visiting my blog and leaving me a ?. APF is maida or all purpose flour and Mawa is a milk powder that we get in the Indian store. You can also make the same with regular milk powder. This is very good recipe and turned out very well. Try it and please let me know how it turned out. Good Luck. Gubab jamum was fantastic. The recipe works fine if you follow all directions. 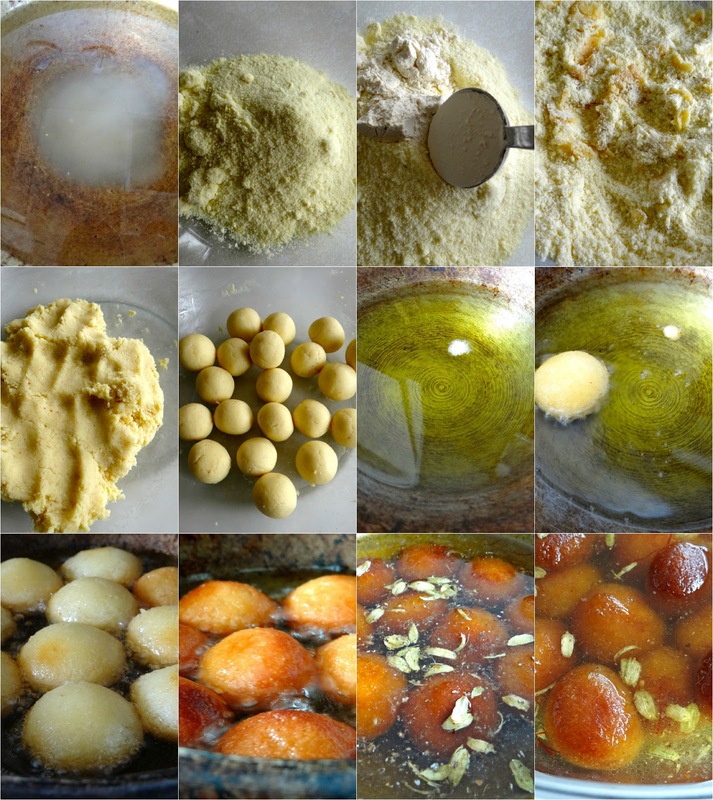 Indian sweets are hard to make anyway. I think the oil temperature should be steady and not turned up and down. The dough should be mixed properly too. Thank you for the nice post. 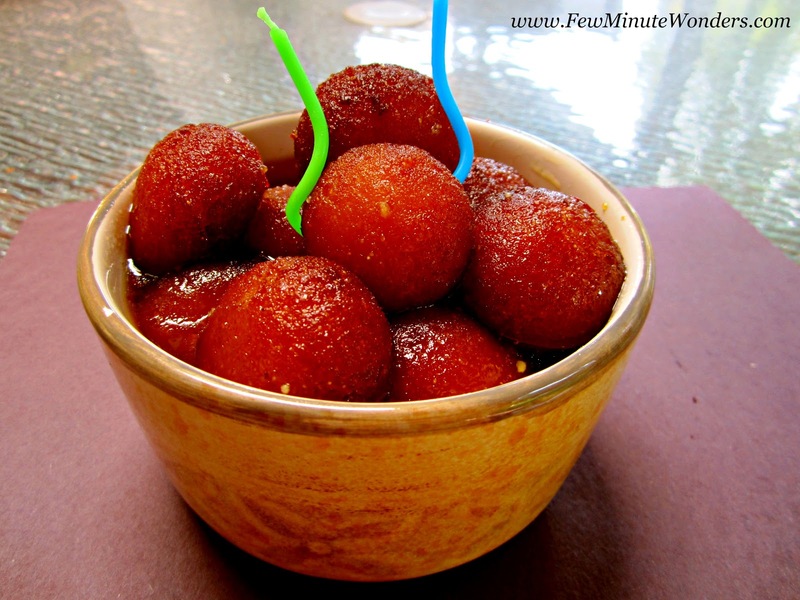 I usually make gulab jamuns using non fat milk powder (Carnation), and they turn out to be soft and yummy. I tried making them today using milk mava powder, and followed your recipe. However, the jamuns disintegrated in the oil while frying ?? I had the same feeling, that it could be the oil temperature, so i tried adjusting the same while frying my next batch, but it still did not work. Hopefully you might be able to figure out. Today, I checked the recipe from the book " Food of India", I made sure that I had the recipe right. Next, I made the GJ's and as you can see, they did not disintegrate. The temp at which I deep fried was medium. Secondly, I did not touch the GJ's when they were frying. This is very important to keep it from disintegrating. Thirdly, the self raising flour needs to be correctly measured and added. Fourthly, the recipe does not call for non-fat milk powder, it suggested low fat powder, so I used mava powder just because it adds more flavor. I hope it works out for you the next time. 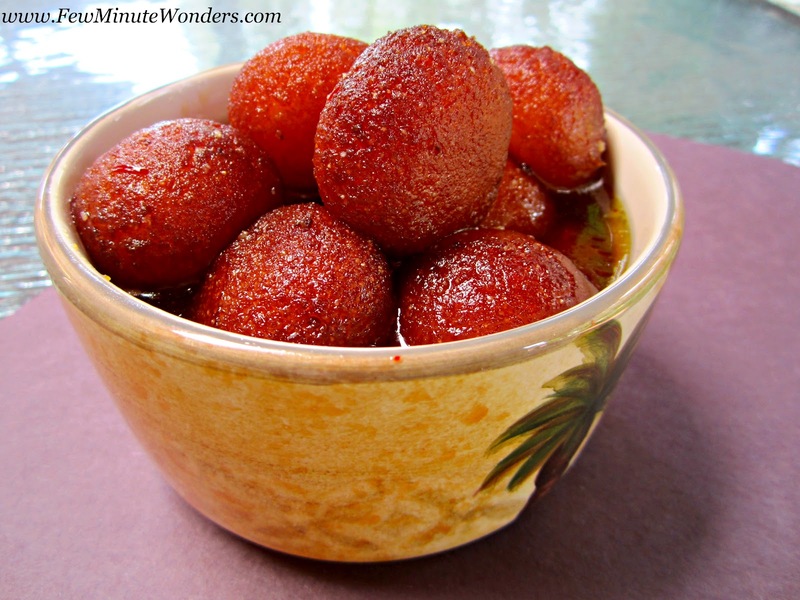 I usually make gulab jamuns using the carnation brand milk powder, and they turn out really good. About two months back I found milk mava powder at the Indian grocery store, and bought it with the intention of making jamuns using it, as I felt it might taste better. The attempt did not work out, as the jamuns disintegrated in the oil while frying. At that point of time I felt it could be due to the high fat content in the powder, or less binding efficiency. Hence, when I stumbled upon your recipe I decided to try again, using your recipe. I felt the rava used could do the magic. However, I encountered the same problem. I did fry the jamuns at medium temperature, and I am sure I used the right proportion of ingredients. I usually do not go wrong even in my first attempts. Guess it could be the mava powder, as from the posted pictures, the powder you used appears to look coarser.